This is part 6 in a series on various studio equipment, what it does, and how to choose! What does an Audio Mixer do? What is a USB DAC? What are Studio Monitors? Glad you asked! Before I tell you, sign up here for amazing updates! Click here to be taken away to another site that has nothing to do with what you came here for! Just kidding, lol. Grab a snack, sit back and relax though because.. When I think of the word “monitor,” I usually picture a computer monitor. You may be the same way. Even now that I have studio monitors, I always just think of them as speakers, regardless of the fact that I do mix/monitor on them. For the longest time, I relied solely on a pair of Sony MDR 7506’s for mixing. While they are the industry standard, and helped improve my mixes immensely, I knew that at some point I needed a pair of monitors to really hear what was going on. Closed back headphones can only take you so far, but open back headphones are another story. Closed back vs. Open back headphones. If you have a good pair, they do mimic speakers to an extent, by providing a phenomenal Soundstage. What is Soundstage? Regardless, you will eventually want to have both in studio to reference back and forth on, and make sure the mix is proper. I waited a long time to purchase monitors, and frankly I don’t know why. Probably strapped for cash 😛 I also didn’t know too much about Cables & wiring, and how to build a home studio. The process was intimidating to say the least. In all actuality, it really isn’t that complicated, but people throw around terms so loosely, that it becomes just that when you’re trying to figure out what’s what. When I finally decided to bite the bullet, I went with the LSR 305’s. A perfect entry level monitor. Check out my JBL LSR 305 Review! As mentioned above, they’re basically just speakers, but allow you to monitor what’s going on in your mix if you happen to be a producer like me. If you have a good pair, they will reveal the flaws in your recording, as well as the music you may already have lying around. The beauty of it is that high quality source files will likely sound amazing. You may be prompted to go back and listen to all of your old vinyl, CD’s, etc. just to really soak it all in. Monitors will reveal even the subtlest of nuance in good audio, and for that reason become an almost spiritual experience for some. I’ve read countless amazon reviews from people who were in tears listening to the same songs they’ve heard for years, all because they missed out on details that their new monitors picked up on. Coming from experience, it really is an amazing revelation (with good headphones as well). 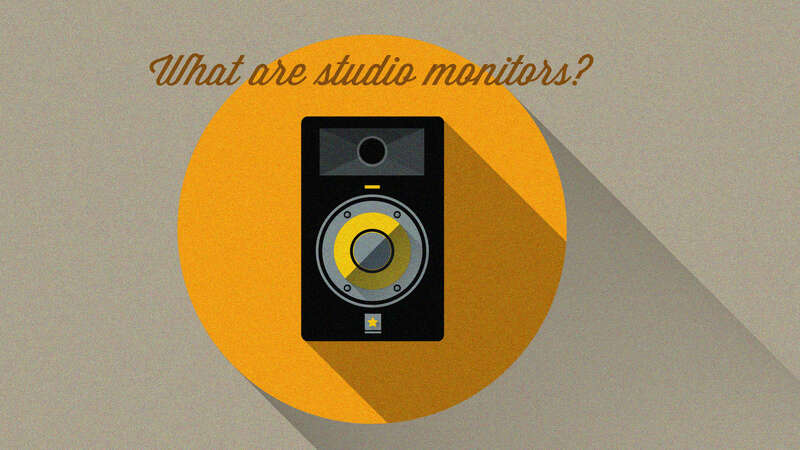 Studio monitors could also refer to headphones, because a lot of them are called just that. Check out my Sony MDR 7506 review for a great pair of entry level ones! These are what I started out with, and still remain one of the most viable first purchases you can make in contribution to your studio. A lot of people will tell you not to reference on headphones, but I personally think both is fine. I actually prefer listening with headphones, but that’s another matter altogether. Your main monitors should be your go to, while your headphones act as a back up reference point. If you decide to purchase a pair, the set up is very important. If you purchase near-fields, they should be very close to you, as the sound isn’t meant to travel that far. This is your common desktop/bookshelf speaker, and each monitor should form an equilateral triangle pointing to your dome piece. The tweeter (which accounts for the treble/mid range) should be about level with your ears, and the monitors should be elevated so that the sound actually will travel towards your ears, and not below or above them. This will give you the very best possible sound in whichever room you are in. This is very important, and something that I learned the hard way. If your room doesn’t have some basic Acoustic Sound Treatment, your mix may not translate well. Case and point: One time I was mixing a beat using my monitors and the bass sounded really smooth. When I subsequently put on my headphones to reference it, it was way to loud and muddy. It sounded awful! Because I didn’t have any bass traps in the corner, and foam panels on my walls to absorb some of the deficiencies that were present in my room. Do yourself a favor and invest in a few of these. You don’t really have to go crazy at first, but you will definitely need some of each regardless. Check out this great post on Acoustic Sound Treatment 101 as well! He covers a lot of the stuff that I’m not as well versed in. Studio Monitors via XLR or balanced TRS/unbalanced TS > Audio interface > laptop via USB. It’s really as simple as that. Find out more about how your computer processes all this in my bit depth vs. sample rate article! Also check out the difference between balanced and unbalanced cables and how that could effect your audio: TRS. vs. TS! Recommending studio monitors can be a bit tricky, because of the fact that it’s more subjective, and very much based on the reputation of the company. It’s also a bit more difficult to test out different monitors due to their size, as well as the variances in gear that accompanies them. i.e. Your audio interface. That said, the JBL’s make amazing entry level units for my studio. JBL LSR305 – Small/Medium sized rooms. Best Price to Performance Ratio. Room Treatment optional but recommended. Yamaha HS7 – Medium sized rooms. Best Overall. Height: 15.4" x Width: 9.8" x Depth: 13.1"
Height: 13.1" x Width: 8.3" x Depth: 11.2"
CHECK OUT MY OFFICIAL JBL LSR 305 REVIEW!! What is a Planar Magnetic Driver? | BEST ANSWER HERE!! What does an Audio Mixer Do? | CUTTING THROUGH THE CONFUSION!